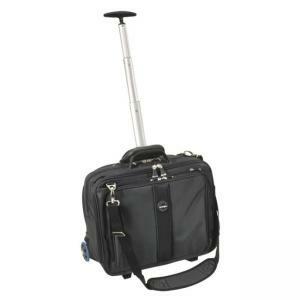 Roller case with ergonomic design delivers go-anywhere comfort and protection and accommodates most laptop screens up to 17". SnugFit protection system provides superior notebook computer safety. Five-stage telescopic handle shifts weight onto the wheels for easier roller navigation and adjusts to your height. In situations where the case needs to be carried, the Contour system helps reduce shoulder and neck fatigue by up to 35 percent. 1680 Denier Ballistic nylon protects against abrasions, punctures, and tears. Roller case also includes a convenient compartment for on-the-go access to aircraft tickets, expandable utility pockets for water bottles and zip-front access compartment for key items. Padded back compartment keeps peripherals from poking through. Endorsed by American Chiropractic Association. Handle Measurement:1st stage - 7" , 2nd stage - 11" , 3rd stage - 17.25" , 4th stage - 23.5"